The purpose of education is dependent on the form of the family and society, and the historical context and place an individual is raised within. Our American form of society is primarily a representative democracy founded on the principles in the Declaration of Independence and the Constitution as amended. The current context is one of rapid economic globalization oriented towards knowledge-based industries aimed at increasing human longevity and enhancing human capabilities. This form of society recognizes the individual as being the source of legitimate authority and responsible for both self-conduct and the preservation of the society. Such a society is constituted of ever-expanding spheres of local autonomy, beginning with the individual and proceeding outward through the family and voluntary associations, followed by city, county, regional, national and global political jurisdictions. The importance of each sphere of local autonomy is directly proportional to the closeness to the individual, who holds ultimate responsibility, through their representatives, for the consequences of the exercise of delegated authority and power. The most important sphere of local autonomy is the individual and the immediate family and the least important are global jurisdictions. Individuals within our form of society have a dignity that cannot be taken away from them by any power on earth because of their unique moral capacity; they are their own masters, they choose their own ends and do not have their ends chosen for them. Individuals are recognized as created beings; they did not create themselves and cannot give away the rights and responsibilities that come to them from outside themselves. Due to this inherent dignity and as the individual source of political authority, learning self-control is vital to educational success. Students develop self-control through learning to obey authority that they accept as legitimate. If students never learn to obey others, they can hardly learn to obey their own internal restraints; they will have recurring trouble resisting harmful vices or issuing orders while leaving people’s dignity intact. They will, therefore, have difficulty achieving happiness or justice. Parents and teachers are obeyed because they possess superior knowledge that students both need and desire, exhibiting a natural hierarchy. Desiring to excel at acquiring knowledge develops the kind of character necessary for the preservation of our form of society. Developing character and achieving happiness is the terminology of secular education; within religious education, this is called the formation of the soul, both types of education are prevalent in our society. To develop character means to refine our coarse emotional states and base desires into civilized and tasteful emotional states and higher desires. It also means to seek the truth, in community with others, sharing common meanings within a clear and practical language, doing good oneself and promoting good in the larger spheres of local autonomy. Early examples of democratic local autonomy were the Ancient Greeks and Renaissance Europeans. The classical liberal arts curriculum of grammar, rhetoric, logic and arithmetic was developed because these building blocks met the needs of this form of society. These building blocks remain sound for our representative democracy and our knowledge-based global economy because they provide necessary learning within the fundamental realms of meaning, truth and purpose. Grammar is necessary for all the social sciences broadly addressing meaning. Arithmetic and logic are necessary for all the natural sciences broadly addressing truth. Rhetoric is necessary for all the arts and humanities broadly addressing purpose. Once these basics have been mastered, the student has the conceptual tools necessary to go deeper into any single fundamental realm or into interdisciplinary areas between realms. Teachers guide students into studies of works proven to have permanent worth, as Matthew Arnold put it, “the best that has been thought and said.” A student might choose to learn more between the realms of meaning and purpose, such as law or anthropology, or between the realms of purpose and truth, such as medicine or engineering, or between the realms of truth and meaning, such as economics or business (see World-of-Education Map below). The most general learning, relying equally on the tripod of the basic curriculum within all three realms, is in the areas of history, philosophy, politics and spiritual thought. This is the knowledge all individuals within representative democracies should attempt to achieve, at least to the degree that informed decisions are possible. Representatives themselves require this most generalized knowledge during periods of rapid technological, indeed, revolutionary changes of unknown scope and duration. 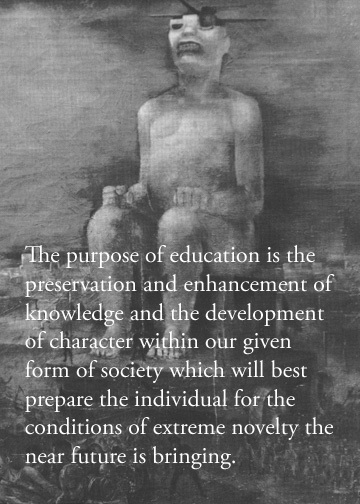 The purpose of education is the preservation and enhancement of knowledge and the development of character within our given form of society which will best prepare the individual for the conditions of extreme novelty the near future is bringing.